Gigi Leung Wing Kei in the fantasy comedy THE MONKEY KING 3 (SAI YAU GEI NUI YI GOK) played the preceptor, her presence and fantasy make up opened the eyes of many. 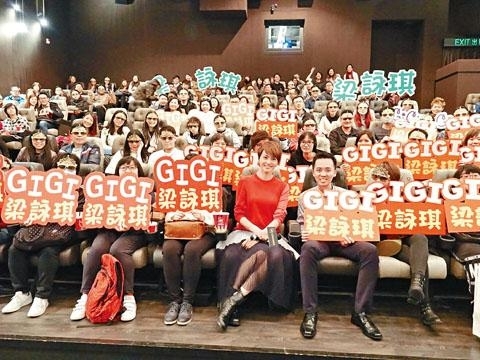 The film company earlier held a screening in Causeway Bay for Leung Wing Kei's fans to watch THE MONKEY KING 3 with Gigi and celebrate the Lunar New Year together! Gigi in the film played the dominating preceptor, her relationship with the King Zanilia Zhao Liying was both like the king and its official and mother and daughter; with the asexual "River God" Lin Chiling she even had a delicate relationship. In order to strengthen the preceptor's presence, she tried Hollywood special effect make up for the first time. Everyday for work she had to be in make up 5 hours in advance, and after work she would spend 1 hours to remove it. 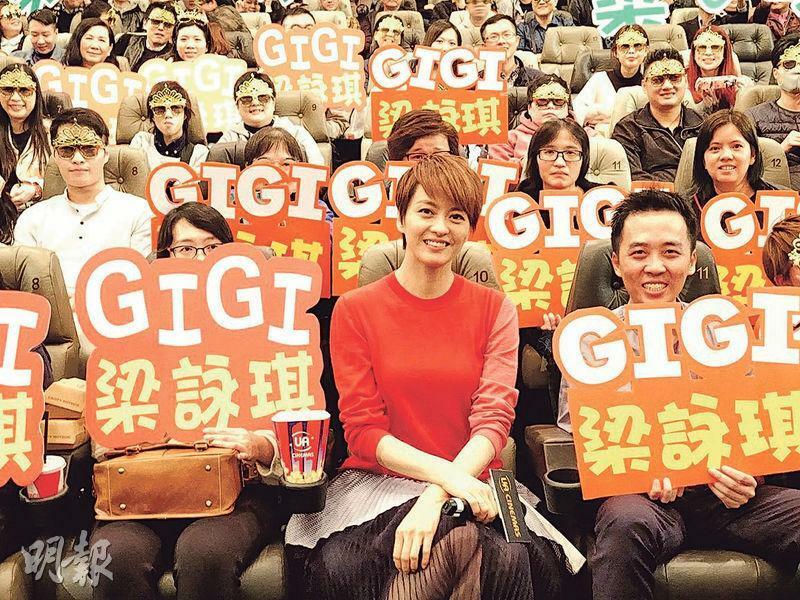 Gigi stressed to her fans, "Although my hair line is very high in the film, my forehead isn't so high naturally. It's make up effect!" Some fans watched THE MONKEY KING 3 that day, and some watched it again. All praised it as "entertaining!" Early in the month Gigi attended the Beijing premiere. This was the first time she watched the Cantonese version. She said, "Both times the emotional spots were the same, the scene in which the Tang Monk and the King let go for their relationship and when I watched the King let go of everything Herland and jumped into the sea with the Tang Monk. Watching them again I was still very moved!" For the Lunar New Year, fans asked Gigi for lai see. "For real! Earlier they asked me and they were too sudden! I didn't have any lai see on me." Actually every year Gigi would take her daughter Sofia's lucky money and donate it to charity organization. Since this time she did not prepare lai see for fans, she decided to follow Aaron Kwok Fu Sing's lead and donate the lai see in the name of all Hong Kong. She said, "Since every year I would donate Sofia's lucky money, this year I would make a donation in the name of the fans. I would follow Sing Sing's lead and double the happiness. It would be both meaningful and charitable, which would be pretty good!" [2018.02.03] AARON KWOK GOES "SANS PANTS"